A few years ago, Lynch and her husband visited a public library in Munising where patrons could “check out” packets of flower and vegetable seeds. At the same time, administrators at the Grosse Pointe library were asking employees for new program ideas, Lynch said. The idea of seed lending libraries has gained momentum in recent years as a way to encourage community gardening and protect seed biodiversity, Lynch said. More than 500 seed libraries now exist worldwide, up from about 300 four years ago. Commercialization of seeds narrows the varieties down to the most marketable ones, Lynch said. For that reason, she focuses on circulating heirloom varieties to play a role in maintaining food crop biodiversity that helps species withstand threats such as diseases, climate change, and pests. Lynch also wants to encourage gardening as a hobby to strengthen families and the community. In some seed libraries, patrons check out seeds, grow crops, and harvest seeds from the plants at the end of the growing season to return them to the library. However, to control seed quality, the “Grosse Pointe Grows” program for now buys seeds from catalogs and distributes them. Because seed packets sold through catalogs contain more than the average gardener needs, Lynch repackages the products in envelopes she makes herself from discarded paper and books. 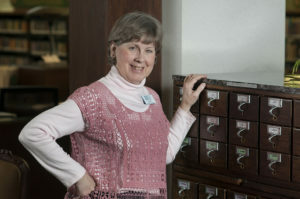 She adds labels and bar codes, and sorts them into drawers in the card catalog for checkout. Lynch spent months refurbishing the 30-drawer card catalog to match the library’s décor – stripping and sanding it and adding a new formica top to match marble countertops elsewhere in the building. Last year, more than 3,066 packets of seeds were checked out from the branch. “It’s a very popular program” Lynch said. Maryanne McKenna is a longtime Grosse Pointe gardener who loves being able to pick up high-quality seeds from the library, including peas, peppers, and tomatoes.